Currently, cardiovascular disease is the second highest cause of death globally. The occurrence and development of Acute Coronary Syndrome (ACS) have attracted attention, and inflammation has been found to play an important role in the occurrence and development of ACS. We investigated the roles of interleukin-17 (IL-17) and interferon-gamma (IFN-γ), as well as their relationship, in patients with ACS. We analysed the dynamic changes in IL-17 and IFN-γ levels in patients with ACS before and after Percutaneous Coronary Intervention (PCI). Patients were divided into the following 3 groups: (1) an Acute Myocardial Infarction (AMI) group (n=30), (2) an Unstable Angina Pectoris (UAP) group (n=30), and (3) a control group (n=30). We found that the IL-17 and IFN-γ levels were higher in the AMI and UAP groups than those in the control group. However, no significant association was observed between IL-17 and IFN-γ levels and the degree of coronary artery stenosis. A low correlation was found between IL-17 and IFN-γ levels before treatment; however, no correlation was detected after treatment. In the AMI and UAP groups, IL-17 and IFN-γ levels were significantly lower after PCI than those before PCI. IL-17 and IFN-γ may play a central role in the occurrence and development of ACS; however, their levels may not reflect disease severity. Additionally, IL-17 and IFN-γ may act synergistically in ACS. Moreover, the clinical symptoms in patients with ACS can be alleviated and inflammation in the body can be reduced through PCI. Acute coronary syndrome, Interleukin-17, Interferon-gamma, Correction. Currently, cardiovascular disease is one of the leading causes of mortality worldwide and atherosclerosis is one of the most common cardiovascular diseases. Specifically, atherosclerosis and Acute Coronary Syndrome (ACS) have been shown to be associated with the rupture of vulnerable lesions, atherothrombosis, and vessel occlusion [1-3]. Chronic autoimmune processes predominantly involving macrophages, T lymphocytes, and dendritic cells have been shown to play important roles in atherogenesis and the development of ruptured lesions [4-10]. The mechanism of inflammation in Coronary Heart Disease (CHD) is complicated, and the Interleukin-17 (IL-17) family, a group of inflammatory factors, has gained attention for its role in this mechanism . The IL-17 family plays central roles in various arms of the adaptive immune system and these inflammatory factors are important for understanding cytokine networks. IL-17A-F and IL-17A (hereafter referred to as IL-17) are the most widely studied members of the IL-17 family [12-15]. IL-17 family proteins originate from diverse cellular sources and have been shown to be specifically associated with IL-17A . IL-17, the primary cytokine secreted by TH17 cells, was initially found to be associated with memory CD4 T cells and was later found to be also associated with CD8 T-cells, γ δ T cells, and NK cells [14-18]. IL-17 has been shown to have proinflammatory effects on a broad range of cellular targets, including epithelial and endothelial cells, fibroblasts, osteoblasts, and monocytes/ macrophages . The levels of Interferon-gamma (IFN-γ), a type II interferon, are high in the coronary arteries of patients with atherosclerosis . Additionally, IFN-γ plays an important role in the process of T cell-mediated injury and remodeling of human coronary arteries . The contribution of IFN-γ in atherosclerosis is complicated; however, its pro-atherogenic role has been clarified . IFN-γ produced by CD4+ Th1 cells, CD8+ cytolytic T cells, and NK cells helps IL-17 induce the production of pro-inflammatory cytokines and chemokines that act on vascular smooth muscle cells to promote secondary proarteriosclerotic vascular changes . Although the roles of IL-17 and IFN-γ in atherosclerosis have been studied, the relationship between IL-17 and IFN-γ remains controversial. In the present study, we investigated the roles of IL-17 and IFN-γ, and their relationship in patients with ACS. Additionally, we analysed the dynamic changes in IL-17 and IFN-γ levels in these patients before and after percutaneous transluminal coronary angioplasty (PCI). The study included 60 patients with ACS who underwent PCI between 2014 and 2015. All patients were less than 75 years of age and belonged to the Asian Han ethnic group. Patients with the following diseases were excluded: severe heart failure, malignant tumor, acute and chronic infections, autoimmune disease, severe liver disease, and reduced kidney function. According to the WHO classification of CHD, patients were divided into an Acute Myocardial Infarction (AMI) group (n=30; mean age, 55.3 ± 10.4 years; 86.7% male) and Unstable Angina Pectoris (UAP) group (n=30; mean age, 60.1 ± 10.1 years; 90% male). Patients in these groups were diagnosed and treated according to the guidelines established in 2001 and modified in 2014 by the cardiovascular disease branch of The Chinese Medical Association. All patients underwent PCI as standard treatment. A total of 30 individuals with unexplained chest distress and no CHD on routine examination and coronary angiography were selected as the control group (mean age, 53.4 ± 10.2 years; 66.7% male). The baseline characteristics of three groups are shown in Table 1. The demographics of the AMI and UAP groups were similar; however, the number of male patients was significantly lower in the control group than that in the AMI and UAP groups. Patients were treated with clopidogrel bisulfate tablet, aspirin enteric-coated metformin hydrochloride, tirofiban hydrochloride, balloon expansion, and drug-coated stents in the AMI and UAP groups. Preoperative iodine allergy tests were carried out. Iodixanol was injected as the contrast agent in the three groups. Table 1: Comparison of baseline characteristics among three groups. In the AMI and UAP groups, blood samples were collected in EDTA tubes before PCI and on the day of leaving the hospital, while in the control group, blood samples were collected before coronary angioplasty. Plasma was separated by centrifugation at 3000 rpm for 10 min at 4°C and stored at -80°C until analysis. The plasma IL-17 and IFN-γ levels were determined using ELISA kits (Cloud-Clone Corp., Houston, TX, USA), according to the manufacturer’s instructions. The detection range of the kits for IL-17 and IFN-γ was 15.6-1000 pg/ml. Additionally the minimum detection limits for IL-17 and IFN-γ was 6.3 and 6.9 pg/ml, respectively. The detection kit standard curves for IL-17 and IFN-γ were presented in Figure 1. 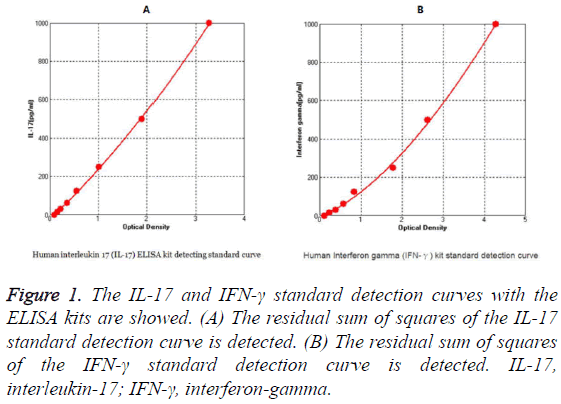 Figure 1: The IL-17 and IFN-γ standard detection curves with the ELISA kits are showed. (A) The residual sum of squares of the IL-17 standard detection curve is detected. (B) The residual sum of squares of the IFN-γ standard detection curve is detected. IL-17, interleukin-17; IFN-γ, interferon-gamma. The Gensini score can be used to evaluate the degree of coronary artery stenosis; therefore, we determined Gensini scores in the patients and compared them to the IL-17 and IFN- γ levels in order to determine whether the IL-17 or IFN-γ levels can be used as auxiliary criteria for assessing the degree of coronary artery stenosis . SPSS 19.0 statistical software (SPSS, Inc., Chicago, IL, USA) was used for data processing and analysis. Data were expressed as the mean ± standard deviation. Continuous clinical variables were compared between groups using the two-sample t-test. Correlation analysis was performed using the nonparametric Spearman correlation test. Additionally, differences among multiple groups were compared using one-way analysis of variance. Specific paired and unpaired tests and post hoc tests were used, and a P-value<0.05 was considered significant. Before PCI, IL-17 levels did not differ between patients with AMI and UAP and were significantly higher in the AMI and UAP group than those in the control group (Figure 2A). After PCI, IL-17 levels were not significantly different among the 3 groups (Figure 2B). The IL-17 levels after PCI were significantly lower than those before PCI in the AMI and UAP groups (Figures 2C and 2D and Tables 2 and 3). aP<0.01, compared with AMI group; bP<0.01, compared with AMI group. Table 2: Comparison of IL-17, IFN-γ levels among AMI group, UAP group and control group (?x ± s). Table 3: Comparison of IL-17 and IFN-γ levels between AMI group and UAP group before and after the standardized hospitalization (?x ± s). Figure 2: The expression level of IL-17 in each group before and after PCI. (A) IL-17 levels are compared among the AMI, UAP, and control groups before PCI. (B) The IL-17 levels are compared among the 3 groups after PCI. (C) IL-17 levels are compared between before and after PCI in the AMI group. (D) IL-17 levels are compared between before and after PCI in the UAP group. Both pre- and postoperatively, plasma IFN-γ levels were significantly higher in the AMI group than those in the UAP group, while the levels in both groups were higher than those in the control group (Figures 3A and 3B). IFN-γ levels significantly decreased in the AMI and UAP group after PCI compared to those before PCI (Figures 3C and 3D and Tables 2 and 3). Figure 3: The expression level of IFN-γ in each group before and after PCI. 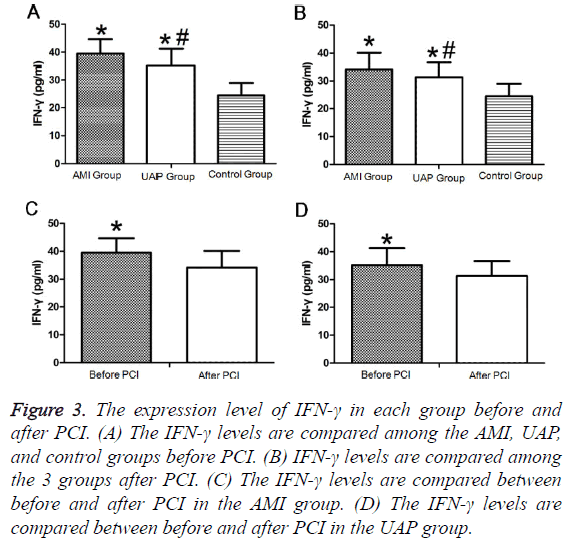 (A) The IFN-γ levels are compared among the AMI, UAP, and control groups before PCI. (B) IFN-γ levels are compared among the 3 groups after PCI. (C) The IFN-γ levels are compared between before and after PCI in the AMI group. (D) The IFN-γ levels are compared between before and after PCI in the UAP group. We detected a low correlation between IL-17 and IFN-γ levels among all groups before surgery (Table 4). No significant correlation between IL-17 or IFN-γ levels and the Gensini integral was found in patients with AMI. Similarly, no significant correlation was observed between the IL-17 and IFN-γ levels and Gensini integral in the UAP group (Table 5). A low correlation was observed between IL-17 and IFN-γ before treatment; however, no correlation was detected after treatment (Figure 4). Table 4: Correlation of serum IL-17 levels with serum IFN-γ levels in ACS patients (n=60). Table 5: Correlation of Gensini scores with serum IL-17 levels or serum IFN-γ levels in ACS patients (n=60). 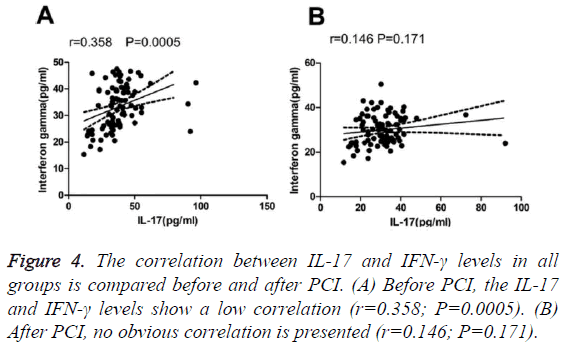 Figure 4: The correlation between IL-17 and IFN-γ levels in all groups is compared before and after PCI. (A) Before PCI, the IL-17 and IFN-γ levels show a low correlation (r=0.358; P=0.0005). (B) After PCI, no obvious correlation is presented (r=0.146; P=0.171). Previous studies have shown that inflammation plays an important role in the occurrence and development of atherosclerosis and that it can cause vessel instability and rupture as well as acute events [1-3,5]. IL-17 has been shown to play a critical role in the pathogenesis of autoimmune diseases such as atherosclerosis by modulating immune cell trafficking and initiating inflammation [11,23]. Additionally, IL-17 has been shown to induce the production of various pro-inflammatory mediators and chemoattractants in monocytes/macrophages, such as TNF-α, IL-1b, monocyte chemoattractant protein-1, and intercellular adhesion molecule [13,23,24]. In the present study, IL-17 levels were significantly higher in the AMI and UAP groups than those in the control group. A study by Ji et al. showed that plasma IL-37 levels in patients with AMI and UAP were also significantly increased compared to those in the control and SAP groups . However, no significant association was found between IL-17 levels and the degree of coronary artery stenosis (Figure 2). The relationship between IL-17 and IL-37 in the AMI and UAP groups was unclear, and these molecules may act synergistically with each other. IFN-γ has been shown to play important roles in foam cell formation, plaque development, and Th1-driven adaptive immune response, which promote the occurrence and development of CHD [21,22]. In the present study, IFN-γ levels were significantly higher in the AMI and UAP groups than those in the control group. Additionally, IFN- γ levels were higher in the AMI group than in the UAP group. However, no significant association was found between IFN-γ levels and the degree of coronary artery stenosis (Figure 3). Serum levels of IFN-γ showed no significant difference between the AMI group and UAP group . Further studies including a larger number of cases are needed to determine this relationship. Coronary atherosclerosis is an extremely complex process involving many factors. IL-17 and IFN-γ have been shown to synergistically affect vascular smooth muscle cells, thus promoting the occurrence and development of coronary atherosclerosis . In this study, a low correlation was observed between IL-17 and IFN-γ before treatment; however, no correlation was found after treatment (Figure 4). PCI is one of the most effective treatments for ACS. In the AMI and UAP groups, IL-17 and IFN-γ levels were significantly lower after PCI than before PCI. IL-17 and IFN-γ may act synergistically in ACS. Moreover, the clinical symptoms in patients with ACS can be alleviated and the inflammation in the body can be reduced with PCI. First, the sample size of the experiment was small. Second, the control group was not representative of a population without the disease because the absence of coronary lesions does not rule out the presence of other diseases. Finally, the results of this experiment were obtained using only enzyme-linked immunosorbent assay; no other test methods were used. The study received financial support from the National Natural Science Foundation of China (Project No. 81360028). Bose D, von Birgelen C, Zhou XY, Schmermund A, Philipp S, Sack S, Konorza T, Möhlenkamp S, Leineweber K, Kleinbongard P, Wijns W, Heusch G, Erbel R. Impact of atherosclerotic plaque composition on coronary microembolization during percutaneous coronary interventions. Basic Res Cardiol 2008; 103: 587-597. Davies MJ. A macro and micro view of coronary vascular insult in ischemic heart disease. Circulation 1990; 82: 38-46. Fuster V, Badimon L, Badimon JJ, Chesebro JH. The pathogenesis of coronary artery disease and the acute coronary syndromes. N Engl J Med 1992; 326: 242-250. Erbel C, Sato K, Meyer FB, Kopecky SL, Frye RL, Goronzy JJ, Weyand CM. Functional profile of activated dendritic cells in unstable atherosclerotic plaque. Basic Res Cardiol 2007; 102: 123-132. Hansson GK, Libby P. The immune response in atherosclerosis: a double-edged sword. Nat Rev Immunol 2006; 6: 508-519. Konstandin MH, Aksoy H, Wabnitz GH, Volz C, Erbel C, Kirchgessner H, Giannitsis E, Katus HA, Samstag Y, Dengler TJ. Beta2-integrin activation on Tcell subsets is an independent prognostic factor in unstable angina pectoris. Basic Res Cardiol 2009; 104: 341-351. Van Herck JL, De Meyer GR, Martinet W, Bult H, Vrints CJ, Herman AG. Proteasome inhibitor bortezomib promotes a rupture-prone plaque phenotype in ApoE-deficient mice. Basic Res Cardiol 2010; 105: 39-50. Plutzky J. Inflammation in atherosclerosis and diabetes mellitus. Rev Endocr Metab Disord 2004; 5: 255-259. Van Herck JL, De Meyer GR, Martinet W, Salgado RA, Shivalkar B, De Mondt R, Van De Ven H, Ludwig A, Van Der Veken P, Van Vaeck L, Bult H, Herman AG, Vrints CJ. Multi-slice computed tomography with N1177 identifies ruptured atherosclerotic plaques in rabbits. Basic Res Cardiol 2010; 105: 51-59. Zhang C. The role of inflammatory cytokines in endothelial dysfunction. Basic Res Cardiol 2008; 103: 398-406. Zhu S, Qian Y. IL-17/IL-17 receptor system in autoimmune disease: mechanisms and therapeutic potential. Clin Sci (Lond) 2012; 122: 487-511. Eid RE, Rao DA, Zhou J, Lo SF, Ranjbaran H, Gallo A, Sokol SI, Pfau S, Pober JS, Tellides G. Interleukin-17 and interferon-gamma are produced concomitantly by human coronary artery-infiltrating T cells and act synergistically on vascular smooth muscle cells. Circulation 2009; 119: 1424-1432.
del Rosario Espinoza Mora M, Bohm M, Link A. The Th17/Treg imbalance in patients with cardiogenic shock. Clin Res Cardiol 2014; 103: 301-313. Weaver CT, Hatton RD, Mangan PR, Harrington LE. IL-17 family cytokines and the expanding diversity of effector T cell lineages. Annu Rev Immunol 2007; 25: 821-852. Li Q, Wang Y, Wang Y, Chen K, Zhou Q. Treg/Th17 ratio acts as a novel indicator for acute coronary syndrome. Cell Biochem Biophys 2014; 70: 1489-1498. Weaver CT, Harrington LE, Mangan PR, Gavrieli M, Murphy KM. Th17: an effector CD4 T cell lineage with regulatory T cell ties. Immunity 2006; 24: 677-688. Li Q, Wang Y, Wang Y, Zhou Q, Chen K, Wang YM, Wei W, Wang Y. Distinct different sensitivity of Treg and Th17 cells to Fas-mediated apoptosis signaling in patients with acute coronary syndrome. Int J Clin Exp Pathol 2013; 6: 297-307. Zhang L, Wang T, Wang XQ, Du RZ, Zhang KN. Elevated frequencies of circulating Th22 cell in addition to Th17 cell and Th17/Th1 cell in patients with acute coronary syndrome. PLoS One 2013; 8: e71466. Zheng Y, Wang Z, Deng L, Yuan X, Ma Y, Zhang G, Gantier MP, Liu JP, Shen L, Xu D. Osteopontin promotes inflammation in patients with acute coronary syndrome through its activity on IL-17 producing cells. Eur J Immunol 2012; 42: 2803-2814. Ranjbaran H, Sokol SI, Gallo A, Eid RE, Iakimov AO. An inflammatory pathway of IFN-gamma production in coronary atherosclerosis. J Immunol 2007; 178: 592-604. Zheng Y, Wang Z, Deng L, Zhang G, Yuan X. Modulation of STAT3 and STAT5 activity rectifies the imbalance of Th17 and Treg cells in patients with acute coronary syndrome. Clin Immunol 2015; 157: 65-77. McLaren JE, Ramji DP. Interferon gamma: a master regulator of atherosclerosis. Cytokine Growth Factor Rev 2009; 20: 125-135. Gensini GG. A more meaningful scoring system for determining the severity of coronary heart disease. Am J Cardiol 1983; 51: 606. Erbel C, Dengler TJ, Wangler S, Lasitschka F, Bea F, Wambsganss N, Hakimi M, Böckler D, Katus HA, Gleissner CA. Expression of IL-17A in human atherosclerotic lesions is associated with increased inflammation and plaque vulnerability. Basic Res Cardiol 2011; 106: 125-134. Erbel C, Chen L, Bea F, Wangler S, Celik S. Inhibition of IL-17A attenuates atherosclerotic lesion development in apoE-deficient mice. J Immunol 2009; 183: 8167-8175. Ji Q, Zeng Q, Huang Y, Shi Y, Lin Y. Elevated plasma IL-37, IL-18, and IL-18BP concentrations in patients with acute coronary syndrome. Mediators Inflamm 2014; 2014: 165742.